Anne Makepeace has been making award-winning independent films for three decades. Her new film, Tribal Justice, was broadcast on POV in August 2017, screened at festivals across the country, and won Best Documentary Feature at the American Indian Film Festival and the Charlotte Film Festival, the Rigoberta Menchu Grand Prix at the Montreal First People’s Film Festival, and the Directing Award at Cinetopia. 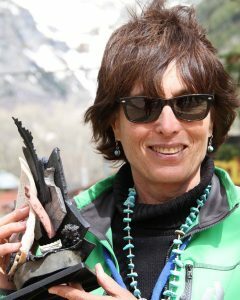 Her previous films include We Still Live Here, which was broadcast on Independent Lens and won the Moving Mountains Award at Telluride MountainFilm and the Inspiration Award at Full Frame; Rain in a Dry Land, which was nominated for an Emmy award, broadcast on POV, and won the Working Films award at Full Frame; the Emmy award winning American Masters documentary Robert Capa in Love and War; and Coming to Light, which was short-listed for an Oscar, broadcast on American Masters, and won many prizes including Best Documentary at Telluride MountainFilm. Her first documentary, Baby It’s You, was the lead show on POV, screened at the Whitney Biennial and was also broadcast on Channel 4 in the UK. Makepeace is the recipient of fellowships from the Guggenheim Foundation and the Radcliffe Institute for Advanced Study.